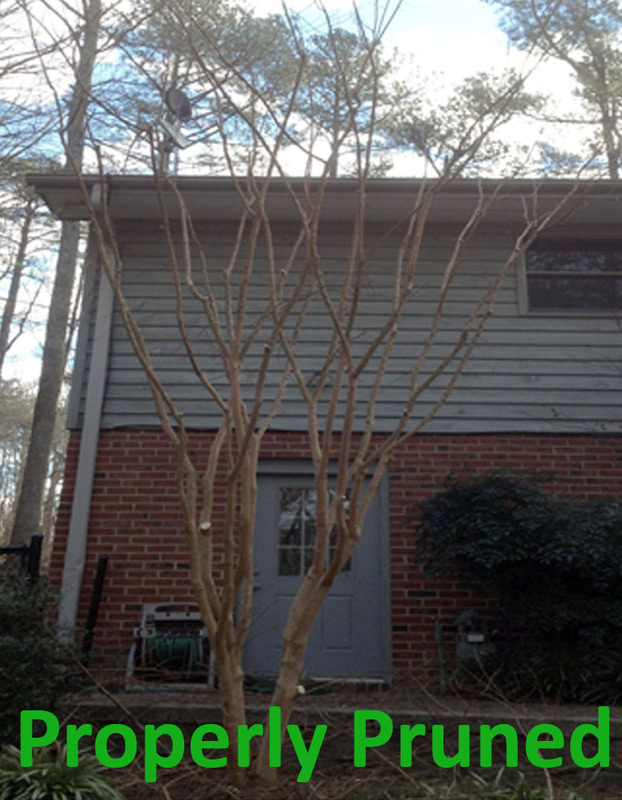 Around this time of year, before the spring growing season arrives, is the perfect time for annual Crepe Myrtle pruning. Annual pruning is important to help bring out the true beauty of Crepe Myrtles. Not just any kind of pruning will do… using proper pruning techniques is a must for this staple in the American landscape. Crepe Myrtles are one of the most butchered plants; cases of “Crepe Murder” are prevalent in neighborhoods across the country. Typically Crepe Myrtles are crepe murdered in an effort to control the height of the tree. Since Crepe Myrtles can grow up to 30 feet tall, make sure you are comfortable with that height in your yard before you install the tree, if you’re not, select a different plant that has a lower mature height. There are a few other problems crepe murder pruning creates. First, the new growth from where the tree is hacked often grows in long spindly shoots. These shoots are not strong enough to support the weight of the beautiful summer flowers causing the new limbs to bend or break off completely. Lastly, improper pruning reduces the production of the Crepe Myrtle flowers and hides the beautiful bark- the two features that make the tree a staple in many American Yards. 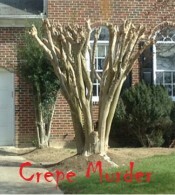 So, how do you avoid crepe murder pruning? I’m glad you asked. Remove any suckering growth from the base and from within the tree. Raise any low hanging branches up to desired height based on the surrounding landscape. Keep in mind that the weight of the flowers in the summer will affect the height, so it’s safe to go a little higher than you want. Remove any dead, diseased, or damaged branches- this is always important to reduce the possibility of disease and insects infestations. Remove any awkwardly growing branches that take away from the ascetic value of the tree. Look back and admire your work. Be thankful you didn’t commit crepe murder!